Meet Sarah: Holistic Pregnancy Consultant and Owner of Mom & Babe - Om Mama Co.Om Mama Co.
We are thrilled to introduce you to Om Mama Collective member Sarah of Mom&Babe! Sarah is a holistic pregnancy consultant based on Bainbridge Island. Om Mama Members receive special package discounts with Sarah – if you’re interested in learning more about becoming a mama member, click here! How long have you lived in the Seattle area? Where are you from/why did you move here? What do you do for a living? Have you always done this? I was born and raised on Bainbridge Island, and while I’ve traveled and lived elsewhere, I always end up back in this beautiful place! I earned my Bachelor’s of Science in Nutrition & Dietetics, with an emphasis on Maternal/Infant nutrition at Bastyr University – since way back I knew I wanted to work with infants (my first job was at a daycare). Following my own experience of pregnancy and childbirth, I wanted to share with others my academic, as well as experiential, knowledge – and so I began creating Mom & Babe, working with expecting, postpartum, and breastfeeding mamas towards better mental, physical, and emotional health outcomes. Through my own experiences of becoming a mother, I was made aware of gaps in care, support, and knowledge. 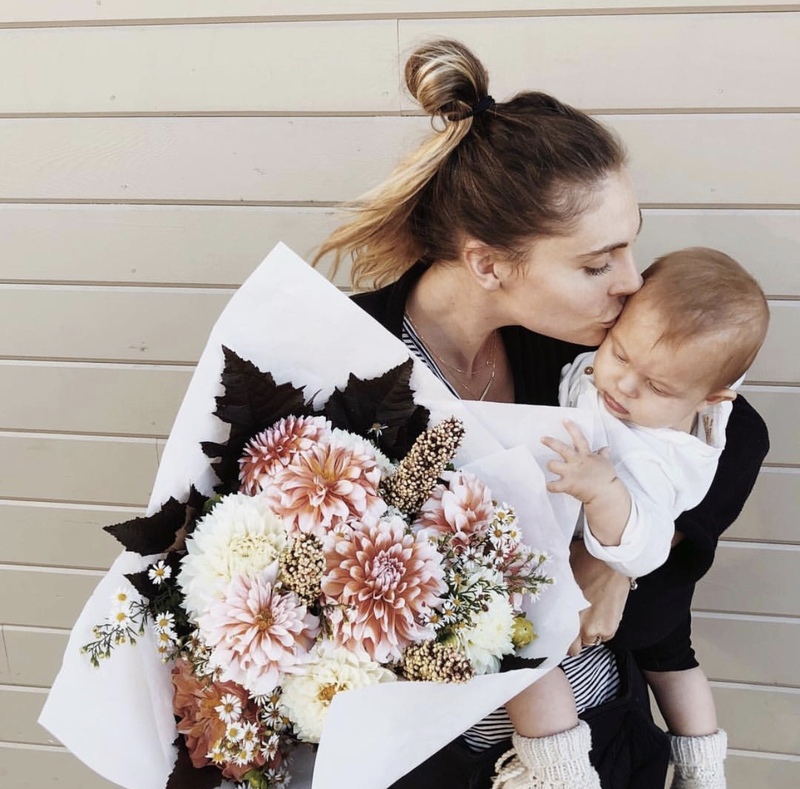 I realized that during the early stages of pregnancy and postpartum, there was a huge lack of support – postpartum was especially challenging for me, personally, as I learned to navigate caring for myself as well as this new tiny human! I wanted to share what I learned and help other mothers prepare for such a special and momentous time in their lives! Oh, I love this question! Mornings are my favorite ☺ Santi normally wakes me up, squirming around, around 7 am – we lay in bed for a bit while he talks away and pokes at his dad’s eyes trying to wake him up. This time of year, we go downstairs, make a fire (because we live in a freezing old house), and some coffee. I stick Santi in his highchair for some puree of the day while I make my oatmeal. We play for a bit on the floor (we’re working on crawling at the moment), then normally head upstairs for his first nap around 9 am. While he’s sleeping I get dressed and ready, take my vitamins, put on my essential oils, and am ready for the day! I have to say, this is one of the most challenging parts of motherhood for me – I love quiet time, and as you can image, that is few and far between these days! When I do get a moment, I like to listen to a Deepak Chopra meditation, read, and get caught up on work or around the house. Essential oils are one way I like to practice self-care – they are such an integral part of my life and I use them for physical, mental, and emotional support throughout the day on myself and my family! What helps you feel strong and/or beautiful? I feel strong at the end of a long day – when I look back on the day and am proud of what I accomplished. Before becoming a mama, I was so efficient – I had been a full-time student, worked a part-time job, commuted 4 hours a day to and from school, and had taken care of my house. After Santi was born, there were some days when I could hardly find time to eat or shower! I had to adjust my priorities and expectations, and now rather than stressing over what doesn’t get done, I can appreciate the things that do get done. A fulfilled and happy life is one where my family is happy and healthy, I’m able to travel, I work a job that I enjoy doing every day – one that challenges me and makes me feel that I am helping others. It’s a life where I have plenty of healthy food to eat, a cozy home to live in, time to learn and explore, and the resources to help others. Not so much a quote, but more of my daily mantra is that everything happens for a reason. When something doesn’t go my way, I think it must be part of some greater plan – everything works out for the best. Did you write a birth plan? How closely did your birth experience follow it? I didn’t write a birth plan. I had planned to, however, my midwives were amazing and when we chatted during one of my appointments, they let me know that all of my requests were common practice at Swedish Hospital now- I was very impressed! It was important to me to practice delayed cord clamping, skin-to-skin, and to begin nursing within the first hour. I also didn’t want to do the “eye goop”, but we did want to do the vitamin K shot. I appreciated how respectful the hospital staff was of all of our decisions. What is one thing you were told you would need and didn’t as a mama? Or the best piece of advice you received before becoming a mama? The best advice I received before becoming a mama was that only you know what is best for you and your baby. So many people will tell you the “right” way. I think it’s important to trust your intuition and always do what feels and works best for you and your baby – everyone is different! What core values do you want to teach your child? Open-mindedness, honesty, passion, and kindness, above all else. I hope that Santi is part of a generation that brings this world together again. What makes you excited about Om Mama & being a part of this community? I love that Om Mama brings mamas together and celebrates this exciting, short phase of life. It’s amazing how pregnancy is less than one year long but is possibly the most life-changing time in a woman’s life. There should be so much love and celebration, however, all of the change often brings about anxiety. Like Mom & Babe, Om Mama wants to address the stress and anxiety so that there is more time for love and celebration!! My website is Mom & Babe, and you can find me on Instagram @momandbabehpc! Catch Sarah’s Instagram Takeover for more Mom&Babe goodness here! Interested in learning more about Om Mama’s photography & wellness partners? Explore our vendor collective here!